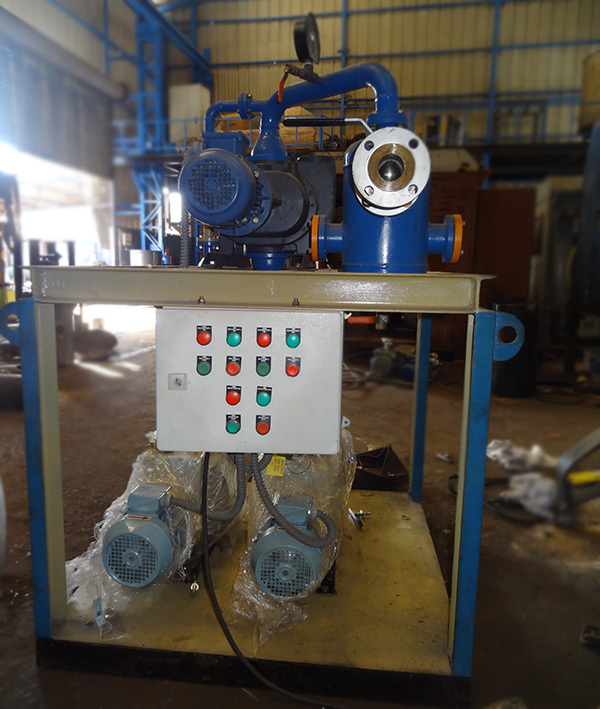 The Pumping system will be Suitable for evacuation of Transformer Tank. Each section of machine will be used high quality material. The Capacity of the system varies according to the size and capacity of installed transformers. The plant will be portable, mounted on four castor wheels with lifting hooks and towing facilities. The plant will be suitable for outdoor use. Proper guarding arrangement will be provided on all such parts, which are liable to cause accident. The design of plant will be such that parts can be easily replaced if required. 2. Vacuum gauge 0-760 mm of Hg (Bourdon type). 4. Piping: The piping used will be fabricated Mild steel tubing and the joints will have flanged and have ring sealing will be of Nitrile rubber. 5. Valves: vacuum valve & Bellows valves, airing valve, Moisture trap etc. 6. Control panel: All electrical control gear mains isolating arrangement, starter, contactors, pilot lamp, push buttons,relays, indicating lamps, metering and interlocking housed in a control panel of CRCA sheet with enclosure. A mimic diagram with indicating lamps on the control panel, all wiring will be neatly routed and all wires terminations will be suitably identify with ferrules. 7. The plant will be suitable for operating on 415V, 3 phase, 4 wires, 50 HZ, AC supply.